If you’re getting ready for your first time in Chaweng, you will surely find this page helpful. It gives you all the information you need to enjoy your first day in the liveliest resort town in Samui. Our knowledge of Chaweng allows us to recommend popular attractions, restaurants and more, helping us to help you have a great time there. Our Chaweng Beach survival guide presents three options for each important topic – dining, shopping, partying, etc. When you arrive in a place you’ve never been to before, it’s nice to know beforehand what to do, where to eat and where to stay. This page should make your life easier on your first day in Chaweng, on the east coast of Koh Samui. As the most popular resort town in Samui, Chaweng has something for everyone. The beachfront hosts great mid-range and upscale hotels, as well as beach clubs and restaurants. Along the beach road, and further inland, you’ll find an eclectic scene of shops, bars, dining and accommodation options for all tastes and budgets. Many of the things you can do in Chaweng are related to the beach. 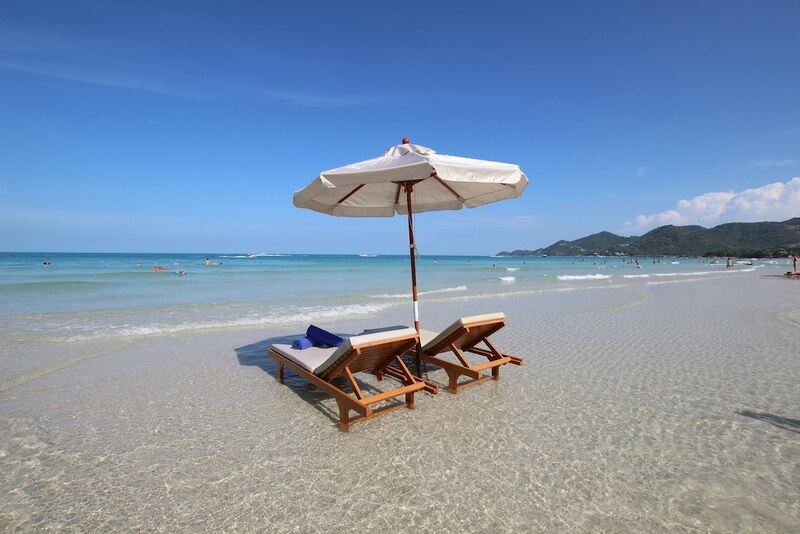 Chaweng’s 6 km strip of white sand is definitely the main attraction here. The popularity of Chaweng has also seen many exciting man-made attractions and activities popping up, creating quite a lot variety. If this is your first time in Chaweng Beach, the following things to do should be on your bucket-list. Chaweng is without doubt the main commercial hub in Samui. Central Festival Samui sits a few metres away from the beach and is the largest shopping mall on the island. There are also markets and many shops and boutiques around to provide you with everything that you need for your holiday. If this is your first time here and you want to enjoy some retail therapy, we recommend you visit the following places. Chaweng is heaven for party people! The resort town features a stunning range of after-dark venues, so there’s something for virtually everyone. Whether you’re looking for high-energy dance clubs, beach-going beach clubs or budget beer bars, you’ll find them in Chaweng. If you come for the first time in Chaweng, the following nightspots are not to be missed. Chaweng attracts a wide range of visitors and has an impressively broad dining scene to match. You can find many national cuisines represented, as well as different styles and settings. You can dine on the beachfront or on a hillside, in modest or opulent settings – the list of places to eat in Chaweng seems endless. We’ve picked out three absolute must-try restaurants for your first time in Chaweng, including one with a high-class setting, one famous for its outstanding international cuisine and one easy-going night market, at which you can sample delicious street food at rock-bottom prices. Chaweng has no shortage of accommodation options. From low-coast guesthouses to top-notch pool villas, and all the mid-range hotels in between, you may find it difficult to find the right place to stay for your first time in Chaweng without our insider tips. We’ve selected three beachfront resorts at different rates. Each of them has all the facilities you need to spend a memorable holiday in Samui.